What is EMC NetWorker ? How much does EMC NetWorker cost ? EMC NetWorker provides a custom pricing for their software. Dell EMC NetWorker is unified backup and recovery software for the enterprise: deduplication, backup to disk and tape, snapshots, replication and NAS. Contact the Vendor for a detailed pricing. I like that it's compatible with several different databases. It's reliable. It's an older technology . There are cheaper products that work just as well. I used this software for backing up and recovery in a medical facility. los respaldos se realizan con efectividad, en muy pocas ocasiones falla, la restauración es rápida, las pantallas de navegación son sencillas y puedes revisar lo que se ha respaldado, la capacidad que ocupo, ver el ID, y la la hora de restaurar puedes buscar muy fácilmente la fecha ID etc. cuando se des configura es muy complicado re configurar los respaldos, cuando se trata de Bases de Datos, a nivel de archivos es fácil. Cuando deja de hacer un respaldo de las bases de datos de exchange se complica. Es sencillo de administrar e instalar, soporta la mayoría de las bases de datos, no se cae o dañan archivos, los datos se respaldan con seguridad, en ningún momento he bajado algún archivo corrupto, todos bien. Tienes una sección de reportes bastante fácil de utilizar. Todos los respaldos en cintas de lo que tenemos en los servidores y en el almacenamiento EMC VNX, y cuando restauramos se hacer rapido, respaldos diarios semanales y mensuales, en cinta y disco externo USB. "Networker solves all my backup needs." Networker has so many features that allow me to backup in a very detailed manner. Troubleshooting could take a while, due to all the options available. However, this is a good thing. Learn all the features, and you’ll enjoy the granularity the product offers. Network is excellent for file level backup. I also like the deduplication. How it ties to DataDomain and can talk to my VMWare environments. How expensive it is and how it has fallen back compared to the other guys who are tackling VMWare backups. Given the price point for this product, it will be better if one looks at Unitrends and Veeam for VM and Physical server backups. Unitrends while being a "smaller" company compared to Veeam or Commvault, surprisingly does really well. Veeam also does phonemically well in the backup space. NetWorker and DataDomain is now considered legacy technology and really hasn't kept up with the newer guys in terms of how quickly one can restore files and backup files. "Backup used from several years"
Scheduling of backups. java interface. Very complete reporting of backups. "Reliable and integration for many applications"
Good scalability. Is possible automating many operations as client configuration. Is possible changing many parameters for tuning performances. 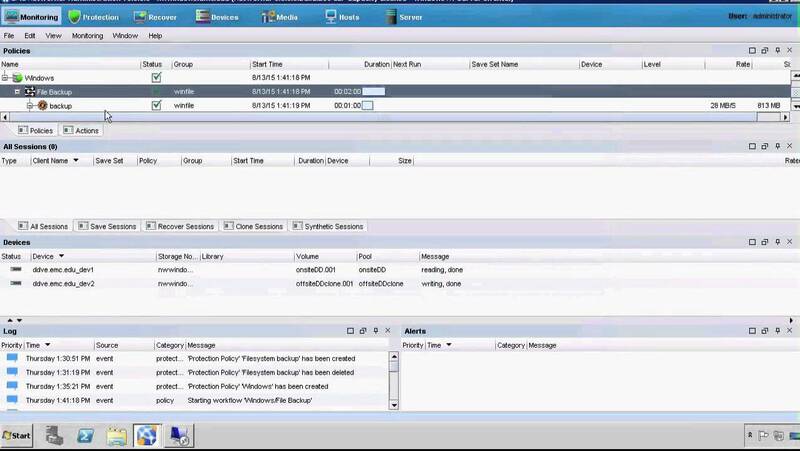 Install and maintain enterprise class backup / recovery using EMC Networker & Avamar. Networker architecture and functionality of all application components such as Master Servers, Storage Nodes, Media Pools, Clients and Juke box configurations etc. 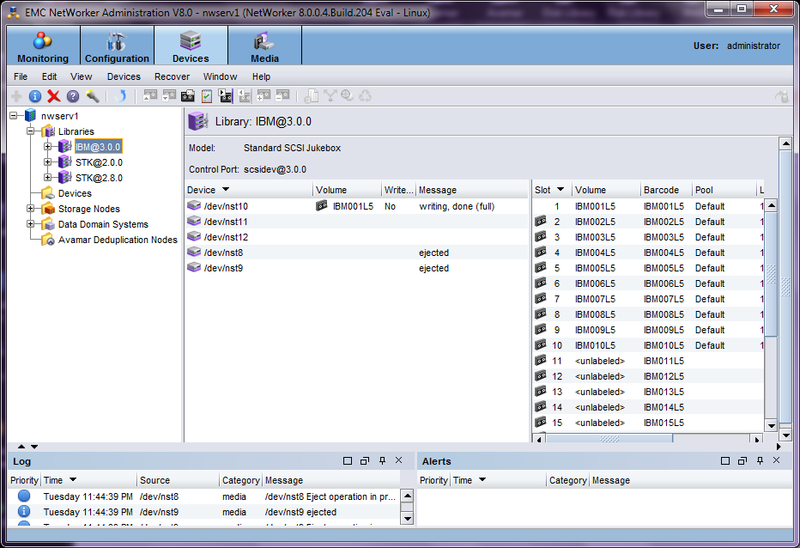 Networker Management Console on a virtual Windows platform. we work on data center and installation, configuration of the enterprise using networker. "Experience lots of environments with using NetWorker." The support is great if you push for the assistance you need. It is just the reduction in head count in support causing delays. At one point a 5 minute delay was unacceptable. Now a five minute delay is a great day. The variety of hardware and software supported makes the product desirable. 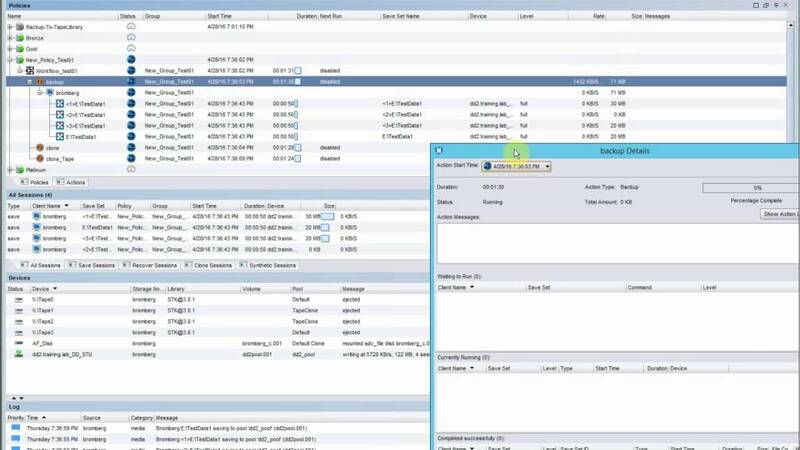 The collaboration available within EMC is excellent. CHAT is very useful to open an initial case. The best is they do not say it is not their issue without reviewing the problem and are willing to engage third party vendors to collaborate. Support is falling behind with the reduction in head count and experience for support. I have had to call the Manager On Duty many times to get support. The adding of new "Centers of Excellence" is adding support staff, but not the collaboration and experience augmenting existing centers would have. Learn the in's an out's. The software has a lot of easy work around's for issues not easy to find or even documented. Use CHAT as an initial point of contact faster to spawn a new case and if it is a real emergency get a warm hand off. Backing up data in a diverse environment from Hospitals to Military. I have worked with NetWorker for several companies. I have implemented, maintained and upgraded The software has the ability to fail and be recovered faster than the hardware can be recovered. I have worked with other backup software and there are ones loath. "Industry leading product - great experience. " Networker has a vast knowledge database/ on line information that enables administrators to quickly resolve issues and learn/plan for the future. This product fully supports itself, only downside is this does not fit well with third party schedulers. DDboost with networker enables you to have one of the best deduplications products available to source clients for less network traffic and better backup times and improved backup windows. Managibility, since EMC bought it, my opinion, is at least 500% better now than it was. We have it writing to Data Domain now, tape is gone. I've worked with Avamar too, but the ability to find a file when the location (directory) is unknown is one of my favorite reasons. The indexes may be found to be its undoing one day, Avamar keeps the index in the saves (self referencing). But as it is now replication, cloning in NetWorker, to a hot site, works as three saves, the one at home site, the save to the hot site, and the index of the save to hot site. So, if you're thinking of implementing it, assure you test DR until you can recover at the hot site before signing off on replication functionality. Implementation of NetWorker can be completed by the client, Avamar and Data Domain require EMC or EMC partner to implement. So NetWorker is possibly more affordable, but if you get it, you'll definitely want Data Domain too, unless you don't have much data to save. NetWorker is saving over 20 petabytes at some implementations currently, and exabytes are probably less than 10 years off. With the amount of data being generated, I wouldn't trust anything but EMC NetWorker or Avamar. I think NetWorker will recover from a disaster faster than Avamar currently though, where you don't have a hot site. I've worked with NetWorker since version 4 in 1999 and Avamar 5 since 2011. I currently use NetWorker 8.2 on Data Domain and Avamar 7 on Avamar Data Store Gen4s. NetWorker and Avamar will most likely merge in the not too distant future with Data Domain or the Avamar Data Store as the storage media in the near future; no one will come close to the value in that for data protection. Indexes in NetWorker for very large clients, where retention time is long and often. Very large indexes may be its downfall. If you're going to implement with very large servers, millions of files per server; over 5 million, go with Avamar. Indexes have to be in excess of 2.5 gb also go with Avamar. Avamar has index size solved by saving the index into the save. Even Avamar isn't designed for systems with over 10 million files per client. The presave has to look at all the files they will save and deduplication has to also for both products. Protecting data. Since no longer using tapes, recoveries haven't failed.